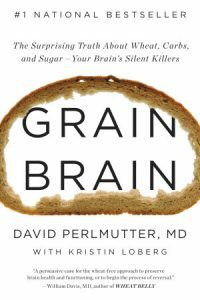 When I told Steve Hudson, a good friend of mine, that I was going to read Wheat Belly, he strongly suggested that I also read Grain Brain by Dr. David Perlmutter, too. He said that I might even like it better. Grain Brain explores the question “what if everything we’ve been told about diet and nutrition has been wrong?” It’s definitely an interesting perspective on things. If you look at what’s happened over the last 25 years since low fat, high carb diets with lots of whole grains has been promoted as the healthy way to eat, the results have not been stellar. Obesity has reached epidemic proportions and illnesses such as Type 2 diabetes has increased considerably. According to statistics cited in the book, diabetes cases among Americans doubled between 1997 and 2007 and continue to rise. And diabetes is just the tip of the iceberg. Dr. Perlmutter shows how the effects of grains and carbohydrates also contributes to brain related maladies like Alzheimer’s and dimentia, which have also been on the rise recently. While I may not agree with 100% of the theories cited in the book, here are a few of the key takeaways that I got from the book and have incorporated into my daily eating habits. While the evidence that is presented in the book is circumstantial, meaning it’s not entirely clear that every modern disease can be traced back to grains and carbohydrates, there’s enough evidence that it is hard to deny that there is some correlation. One of the key takeaways for me has been to cut down on grain-related carbohydrates in my diet. I’ve done some basic things like cutting out breads, but I’ve also made an effort to reduce wheat-based products as well. I’m not saying that I’ve cut out everything. I’ll still indulge in a good spaghetti dinner, but I’ve definitely become a lot more aware of the amount of carbs and calories that come from grains. My second takeaway is that I’ve decided to embrace fats and cholesterol in my diet. It’s a little scary given the number of studies and amount of literature pointing to these items being “bad” for you, but Dr. Perlmutter presents enough strong evidence in his book to make me question current thinking. In fact, your brain requires cholesterol to function, and eating healthy fats from items like nuts, eggs, cheese, and olives can actually lead to more reasonable levels of cholesterol and triglycerides in our blood. I’ve adjusted my diet in this direction over the last month and am curious as to what my bloodwork panel will show, which I just did recently. I’m not expecting any major changes, but it is something that I want to baseline this year as a comparison to prior years, and to see how it will change over the next year. The book also reinforced one of my key life theories – “everything in moderation”. What I didn’t realize until reading Grain Brain and Wheat Belly was just how much wheat and grain was in my diet. The amount I was eating clearly didn’t fit into my everything in moderation tenet. I was probably generating well over 50% of my calories from grain-based foods, and well over 70% from carbohydrates. So while the books advocate cutting out nearly everything grain-based, I’ve decided to take a moderation approach. As I mentioned above, I still engage in a pasta dinner every once in a while, and I still enjoy eating pizza once a week during our office lunch meetings. So I’m not going to abstain from wheat, but I’m clearly more aware of what I’m eating and am making sure that I balance out my grain-based indulgences with calories from healthy fats and better carbohydrate sources such as leafy vegetables. Now that I’ve completed both Grain Brain and Wheat Belly, I’m convinced that we are still at the early stages of understanding nutritional science. For years, medical science has been focused on eradicating life-threatening diseases, especially those that afflict children. They’ve been quite successful. With fewer infants, toddlers and children dying from childhood ailments such as measles, our average life expectancy has risen dramatically. In order to continue to grow the average life expectancy, a new approach is required. Eradicating diseases isn’t as easy, especially when many of those diseases are the result of poor nutrition choices. As we invest more time and effort into the effects of our food choices, I believe we will end up with a much better understanding of how what we eat affects both how we feel and how long we live. It will be interesting to see how this unfolds over the next 10 years or so since we are currently in a very negative reinforcing cycle. High carbohydrate diets that contain a lot of wheat and sugar products are very cheap to produce in mass quantities. Furthermore, they’re addictive and create a high consumption pattern that pads the food companies bottom line. There is no incentive for them to change their ways. Eating high carbohydrate, grain-based diets create health issues that produce symptoms that are relieved by drugs. The number of drugs being prescribed these days for ailments that are related to diet are staggering. It’s impossible to watch more than 10 minutes of television without seeing a commercial for at least one drug, if not more. So not only are food companies benefiting from our poor food choices, but drug companies are, too. It’s lucrative business for drug companies with billions of dollars in revenue and profit made every year. It creates a very negative cycle – food companies profit from making poor foods that lead to drug companies making money selling drugs to alleviate the symptoms. These are two powerful industries that have a lot to lose if the way we eat changes. They also have a lot of money to spend on government studies and lobbying, which makes me look at every study presented by the government with a healthy dose of skepticism. Feeding my skepticism are the results I’ve seen from my own efforts over the last 6 weeks reducing carbohydrates and grains in my diet. I’m not going to say that I feel amazing, but I have noticed a substantial difference in control of my appetite. I find that I’m eating less, and that my food choices are much healthier. It’s also resulted in being able to get below 160 pounds, which is a weight I haven’t been at in over 20 years. While some may say it makes me too thin, it’s in the normal BMI range for my height. I’ve found that it makes me feel much better – more energy, more alert, and moving around better. My goal is to give it another 2-3 months to see how it is going as well as compare with results of blood tests to see how these diet changes are affecting me internally. I chose to read Grain Brain to take my health and diet to another level. In conjunction with my recent read of Wheat Belly, I feel like both books have helped to put me on a better path. Just as I did with Wheat Belly, I would highly recommend Grain Brain and have put it into my Must Read category of books. I’m not saying that I agree 100% with everything in Grain Brain, but I believe the overall message is spot on. The current information we’ve been taught and told about diet is not entirely correct. It’s time we took a different approach to nutrition, one that more closely mimics what our ancestors did, and one that isn’t necessarily the same as the one promoted by the mainstream media, food companies, drug companies, and the government. This entry was posted in Book Reviews, Must Reads and tagged Books, Must Reads on April 17, 2016 by Gregg Borodaty.